On October 31, 2007 the NY Times wrote a story on former SEC Chair Levitt’s public pension concerns yet decided to not include the single most important fact, that being that Levitt is on the board of directors of RiskMetrics, a firm which creates derivative products for hedge funds and is now attempting an IPO. RiskMetrics is the firm that purchased Institutional Shareholder Services, the nations largest proxy firm, earlier in the year and is in violation of one of the SEC’s most important rules with respect to proxy firms, that is, it has not fully disclosed its ownership structure. A search on ISS at this blog will show related blog posts and it relationship to hedge funds, what some call private equity, and the creation of controversial derivative products that have destabilized the financial industry. Parish & Company has been the leader in identifying key corporate governance issues with respect to public pensions and simple needed reforms, including a review of the accounting related to tax benefits by hedge funds and private equity firms, whose largest source of funds is now public pensions. A key question is, since public pensions are tax exempt, are hedge funds booking accounting entries to take advantage of tax benefits left on the table since public pensions are tax exempt? Clearly, it is time for the IRS to challenge the tax exempt status of some large tax exempt entities by requiring them to provide details on such investments in order to verify such deductions are not being used by hedge fund general partners. A good place to begin would be the Gates foundation. When Bill Gates Sr. told me a couple of years ago that his foundation did not own a single share of Microsoft stock, I was simply stunned. One would think that since the foundation was made on the stock that at least a nominal percent of assets, i.e. 5 percent, would be retained. ” As New York State comptroller, his father “saved the retirements” of countless workers, Arthur Levitt Jr. said in a speech yesterday — but he added that now those pensions, along with those of millions of other Americans, are again at risk. 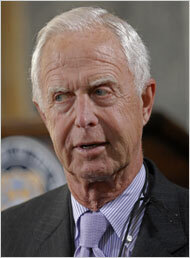 Arthur Levitt Jr. is an adviser to the Carlyle Group. In remarks to pension officials from New York and several other states, Mr. Levitt, the longest-serving chairman of the Securities and Exchange Commission, said their world was fraught with problems, including conflicts of interest, opaque accounting and a tendency among elected officials to promise valuable benefits, then fail to set aside enough money to pay for them. “We can’t begin to improve the fiscal standing of public pension funds until we can accurately assess their financial health,” he said. He blamed a rule-making framework that allows softer accounting standards for governments than for corporations, and called for the repeal of the Tower Amendment, a 30-year-old law that limits the S.E.C.’s authority to police governmental accounting. The current S.E.C. chairman, Christopher Cox, has also expressed doubts about the Tower Amendment’s continuing usefulness but has not called outright for its repeal. He expressed great concern over the practice of some pension officials of soliciting campaign contributions from Wall Street firms. “We have created a situation where workers’ retirement savings are being used for private gain,” he said.